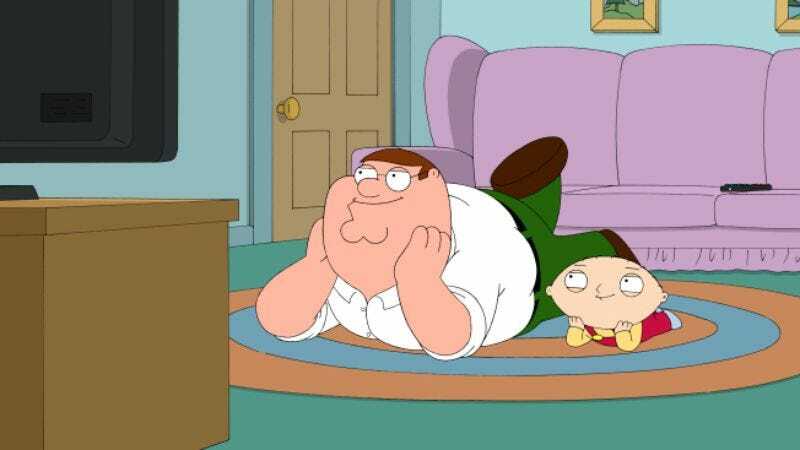 Lest its recent passing on The Flintstones had you concerned that Fox was falling out of love with Seth MacFarlane, the network confirmed today that it has renewed both Family Guy and American Dad for their eleventh and eighth seasons, respectively. Both shows will reportedly get 22 episodes—a number that should be reassuring to American Dad fans that have seen it arbitrarily abbreviated over the years, in addition to it being pushed around to make room for experiments like Allen Gregory or Napoleon Dynamite (the latter of which is still bafflingly, optimistically listed as "on the bubble"). And with enough seventh-season episodes of American Dad in the can that will already take it all the way through the spring of 2012, this renewal ensures that both it and Family Guy will remain on the air through at least 2014, by which point MacFarlane will probably have evolved from making meta jokes about Family Guy's repetitious nature to flat out having its characters ask you why you're still watching. Less certain, however, is the fate of The Cleveland Show: After banishing the Family Guy spinoff to the desolate hinterlands of 7:30 p.m., Fox still refuses to welcome the show back to the hearth of primetime or mercy-kill it, postponing the decision on whether the series will get a fifth season until at least the fall. In the meantime, production on its fourth season is already well underway, so no one will be forced to contemplate the death of The Cleveland Show until long after they've come to terms with the fact that it made it to four seasons in the first place.